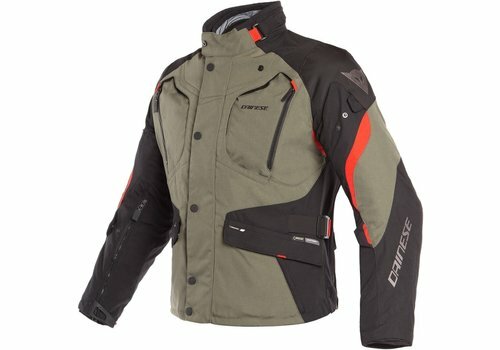 Buy Dainese Dolomiti Gore-Tex Jacket? Free Shipping! Buy your Dainese Dolomiti GTX Jacket at Champion Helmets and get: ✓Best price ✓Free shipping ✓5% Cashback on your Order Value ✓Super Fast delivery ✓Order now! Dainese has released, alongside the Antartica GTX and the Gran Turismo GTX, the little brother Dolomiti GTX in their D-explorer line. This jacket consists of 3 layers. 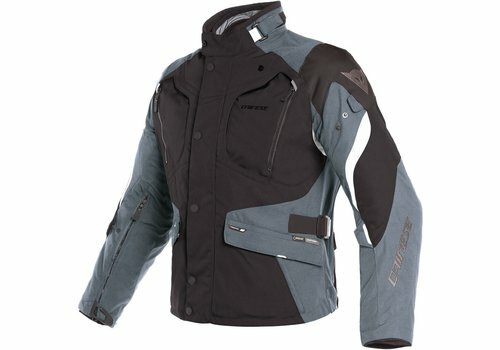 The thermal inner jacket can also be worn as a regular jacket separately from the other 2 layers. The Gore-tex membrane is waterproof, windproof and breathable. And unlike the Antartica GTX and the Gran Turismo GTX, the Gore-tex membrane consists of a loose jacket that you can take out. The Dolomiti has very good ventilation that is lockable with a zipper. It has a large ventilation opening on the sleeves, 2 large ones on the chest and 2 more on the back of the jacket. The jacket is prepared for a G1 or G2 back protector and a double chest protector. The jacket is adjustable on the arms and at the waist for an optimal fit. The counterparts of the Dolomiti Gore-Tex are the Alpinestars Guayana GTX Jacket and the Revit Neptune 2 GTX. 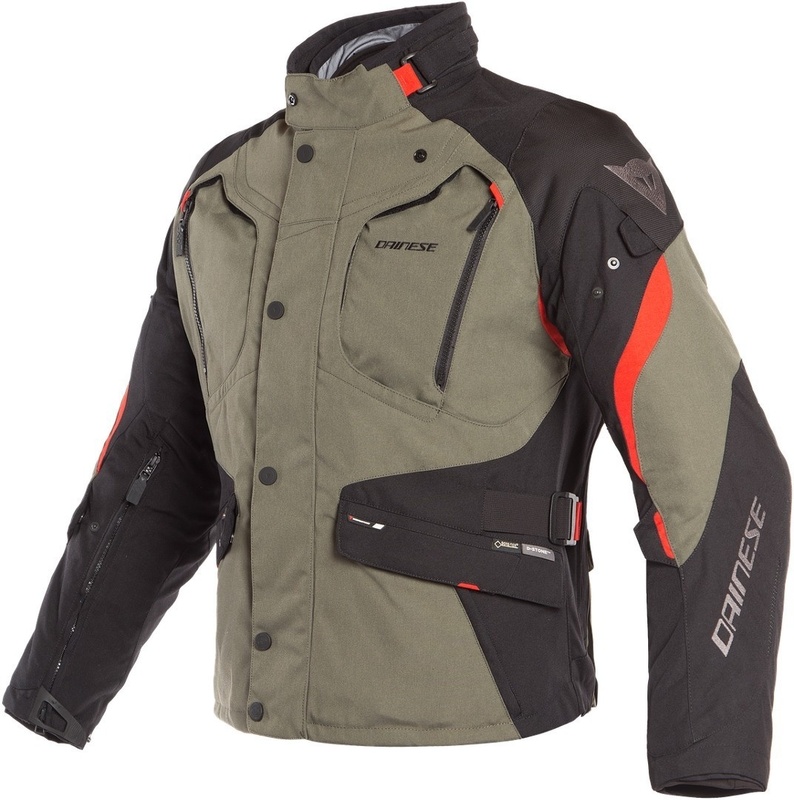 The outer layer of the Dainese Dolomiti GTX is made of the durable Duratex and reinforced with D-stone on the shoulders and elbows. The middle layer consists of a Gore-Tex membrane and the inner layer consists of a thermal Softshell jacket. The jacket contains composite protectors in the shoulders and elbows. There is reflective material on several parts of the jacket. 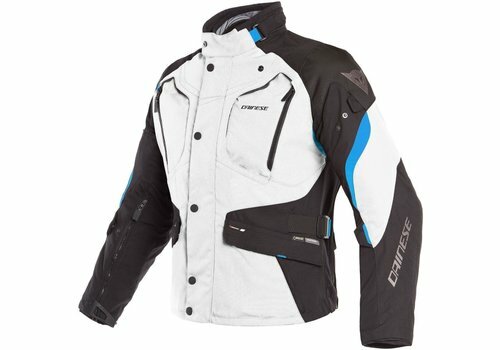 The Dainese Dolomiti Gore-Tex jacket provides optimal protection against all weather conditions and of course against impact and abrasion. 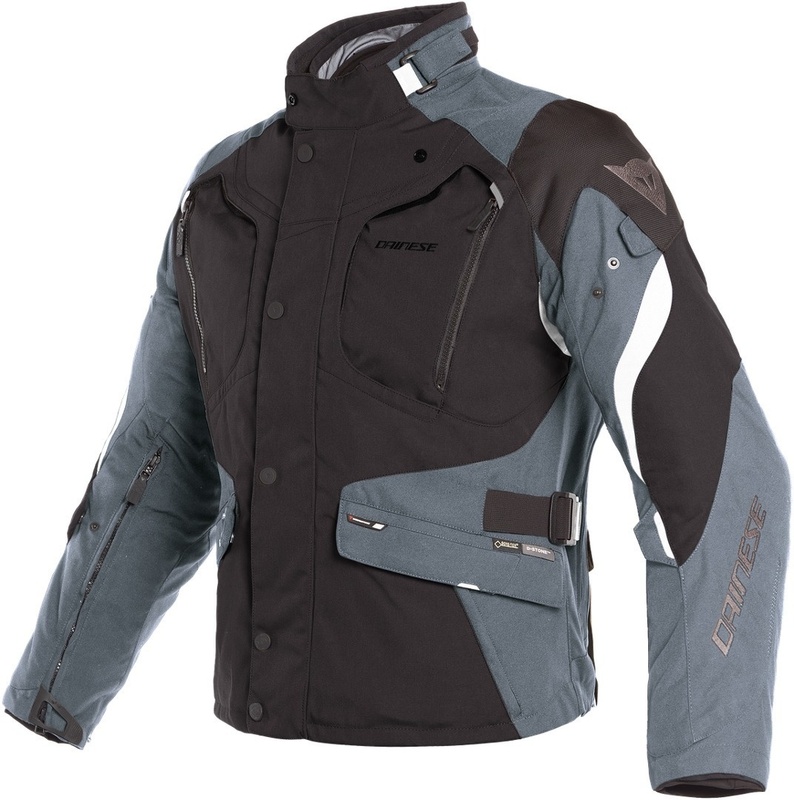 The jacket has removable level 1 certified composite protectors on the shoulders and elbows. Incidentally, the protection can be further extended with a back protector or a double breast protector. During the development, reflection material was incorporated in the design to optimize visibility in the dark. 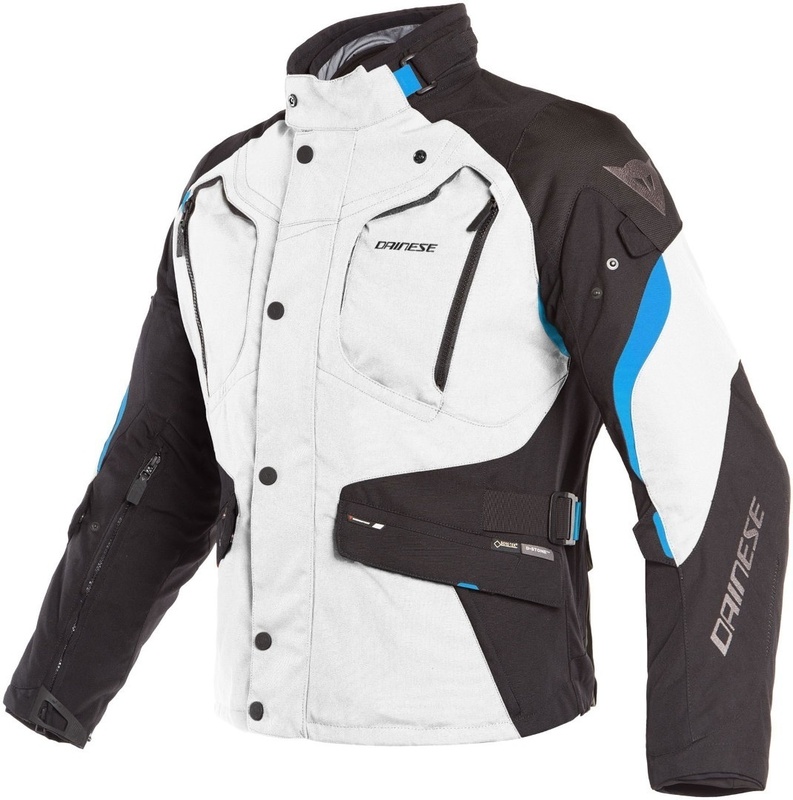 With the Dolomiti GTX, Dainese offers the rider a very comfortable Gore-tex jacket at a relatively affordable price in the D-Explorer line. The different layers offer the wearer the option of easy switching according to weather conditions. The jacket has several adjustment options that contribute to wearing comfort. The collar is easy to adjust using Velcro. On the arm and forearm the jacket can be adjusted with push buttons. At the waistband we used band buckles on both sides. The ventilation of the Dolomiti is more extensive than with the Antartica and the Gran Turismo. The Dolomiti has 2 large lockable ventilation openings on the chest. There are also 2 zippered ventilation openings on the forearm. Furthermore, the jacket has two large vertical outlet ventilation openings at the back and they are also lockable with a zipper. The Dolomiti GTX comes in 3 different colors. It is actually a 3 seasons jacket. But the different layers in the jacket and the extensive ventilation options will add half a season and make it a 3.5 seasons jacket. Furthermore, the dolomiti GTX 2 has waterproof pockets at the front and a large one at the back.